I came across a Sassy Studios' monthly Facebook progressive challenge through their fan page. Jackie Randolph will provide a free image for use during that month's themed challenge. As long as you submit a project showing your use of the image following the theme then you're eligible to win a prize as well as get another free image for the next month's challenge. If for any reason you don't use the image during that month's challenge, then you must sit out the next month's challenge and try again the following month. This type of progressive challenge intrigued me so I decided to try and participate. You can find out more about this Sassy Studios Facebook progressive challenge here. The free image that Jackie is providing for use during this month's "Hearts and a Sassy Sentiment"-themed progressive challenge is called Pin Up Kitty. The photo of this month's Pin Up Kitty project must be uploaded here before midnight EDT on February 13th. After I fussy cut my Copic-filled image, I used my brush-tipped Copic black multi-liner to create a silhouette look of the back in case any part of the back showed beyond my project's edge. I covered the front of my Pin Up Kitty with a layer of Glossy Accents for amazing shine and additional dimension. 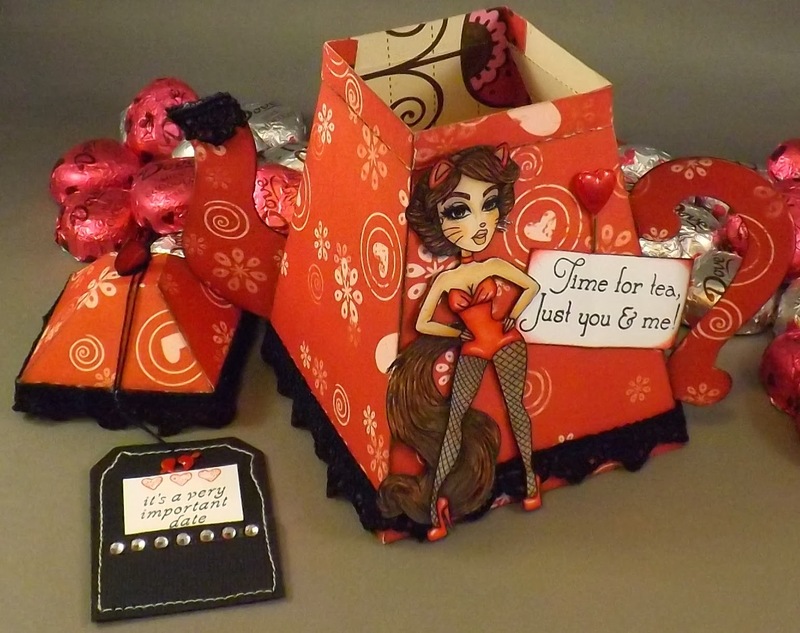 I used Bo Bunny's "Crazy Love" double-sided patterned paper to die cut my Sizzix Big Shot Pro Tea Pot Box. The base of the tea pot and lid as well as the tip of the spout are trimmed with 1/2" cotton black lace. My Pin Up Kitty is popped up along the handle side of the tea pot. An Inky Antics stamped sentiment lies near the kitty image. The sentiment alone doesn't seem too sassy but taken in context near the image I think it can be pretty sassy. A My Minds Eye Miss Caroline Dilly Dally "Best" red heart pin slides behind the sentiment. The lid of the box can be removed. I've folded the base of a Lifestyle Crafts Tag It Kits tag then machine-sewed the edge. The pocket holds a Crafty Secrets Tea with Alice large set sentiment as well as a few hearts stamped with Adirondack Red Pepper ink. A heart with arrow eyelet holds the tag to the tip of the lid with a 20-gauge black thread. A row of Heidi Swapp bling borders the tag pocket. The tea pot stands at 6" tall, is 4 1/2" wide at the base and 3 1/8" wide at the top. That makes a nice size box for holding sweet treats. Oh this project is fabulous Rose ! Wonderful creation ! Now, that is something I haven't seen before. 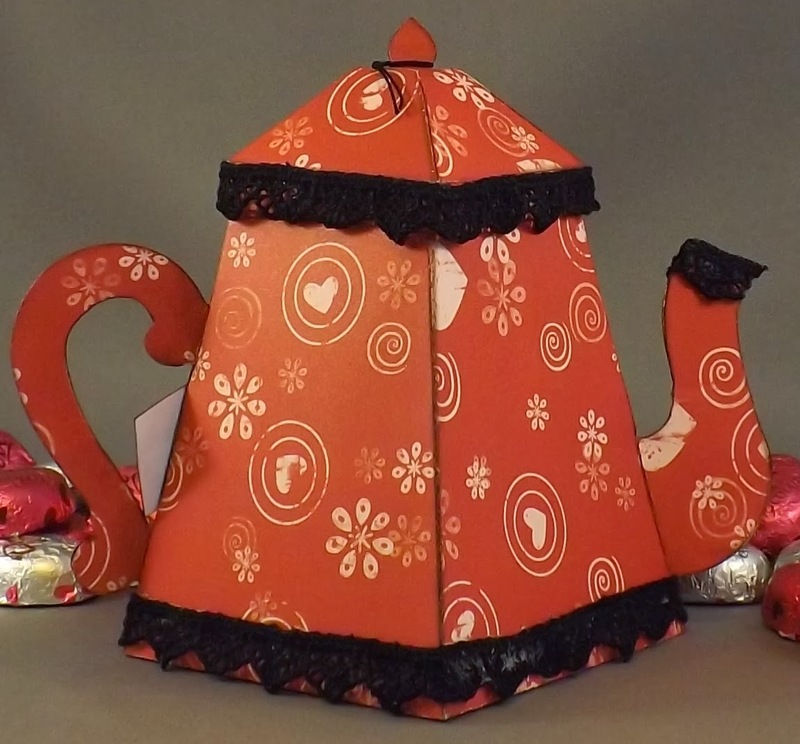 A tea pot card/box - FABulous idea!! What an original design! Great card. Fab project Rose, love the teapot. What a fabulous creation and I love the tea pot die. Great colouring on your image too. Thanks for joining us at Divas by Design. 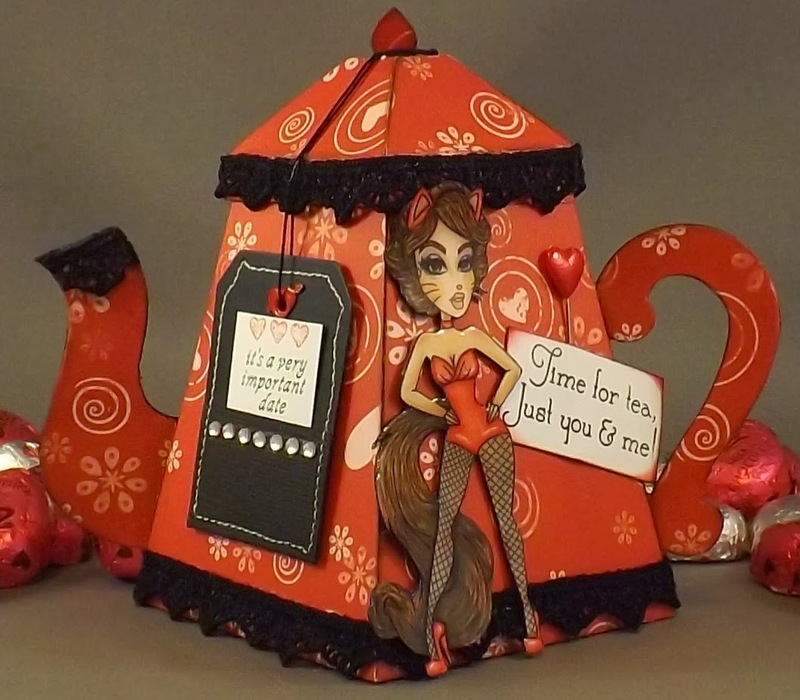 Super teapot for putting a special valentine's treat in for your loved one! Cute design! Thanks for playing along with us at Simon Says Stamp Monday Challenge! Love your beautiful fabulous teapot, great sassy image. so stinkin cute! need to get this sassy image!